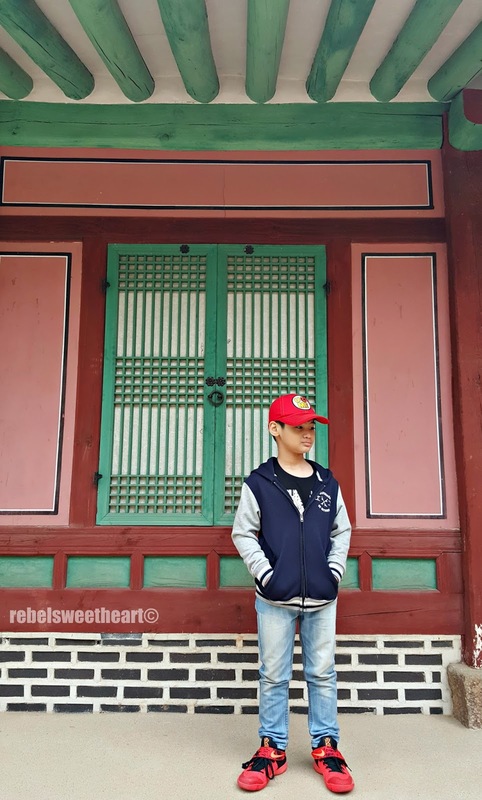 The Rebel Sweetheart. 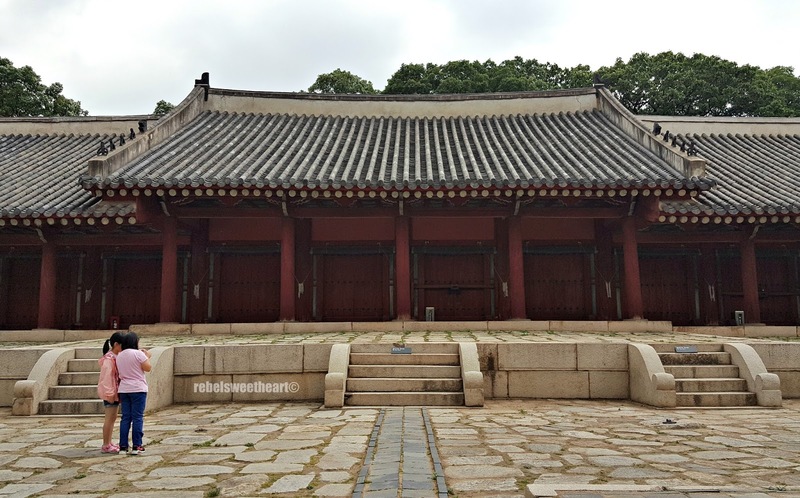 : Seoul Searching | Jongmyo Shrine. Filial piety, they say, is one of the most important virtues and possibly the greatest heritage of South Korea. 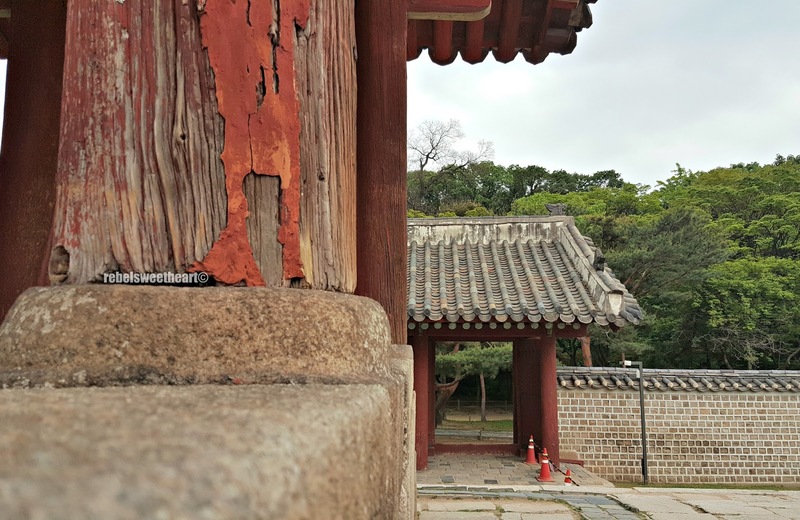 It means the attitude of obedience, care, and devotion towards one's parents and ancestors, and this virtue is clearly manifested in Jongmyo Shrine, the oldest and most authentic Confucian royal shrine to have been preserved. The UNESCO World Heritage marker located near the main road. 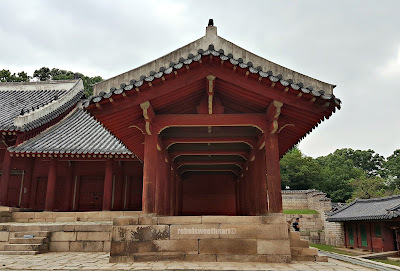 A UNESCO World Heritage Site, Jongmyo is known as the supreme state shrine as it houses the 'spirit tablets' of the deceased kings and queens of the Joseon Dynasty. 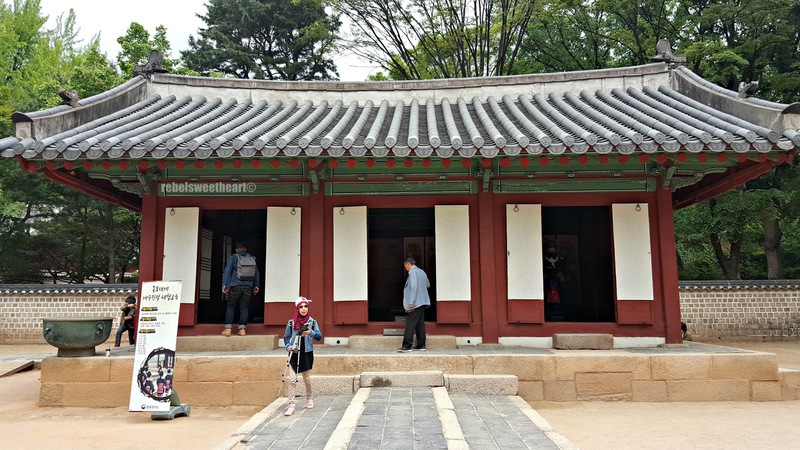 The shrine has existed in its present form since the 16th century, conserving not only its physical form but also the traditional ritual practices of paying tribute to their ancestors and honoring the dead. 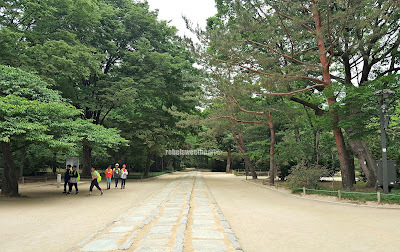 The path leading to the gate of Jongmyo Shrine. 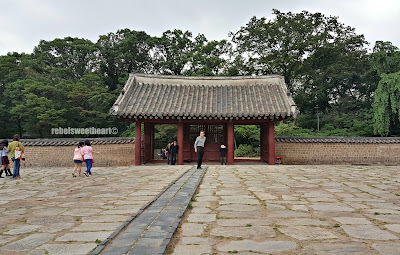 More of Jongmyo Shrine after the jump! 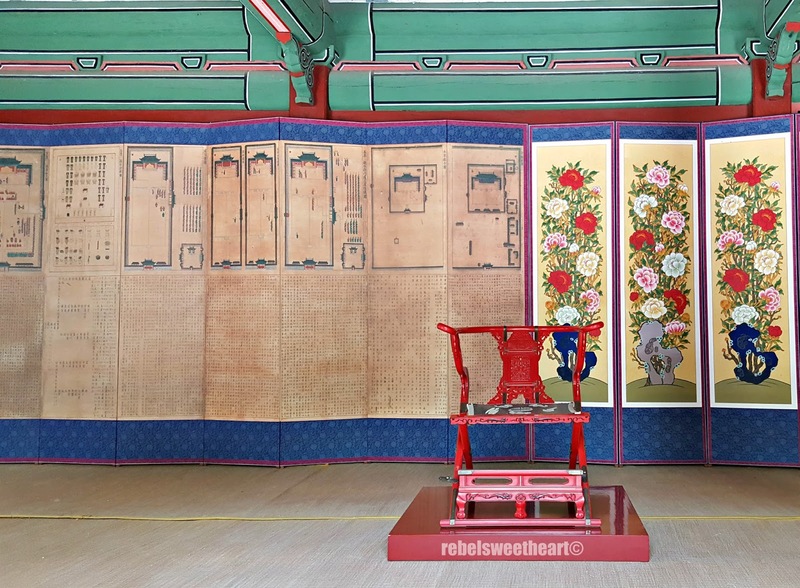 This memorial service is called 'Jongmyo Jaerye', and during the Joseon era, this ritual was led by the king and held every turn of the season and on the twelfth month of the lunar year. 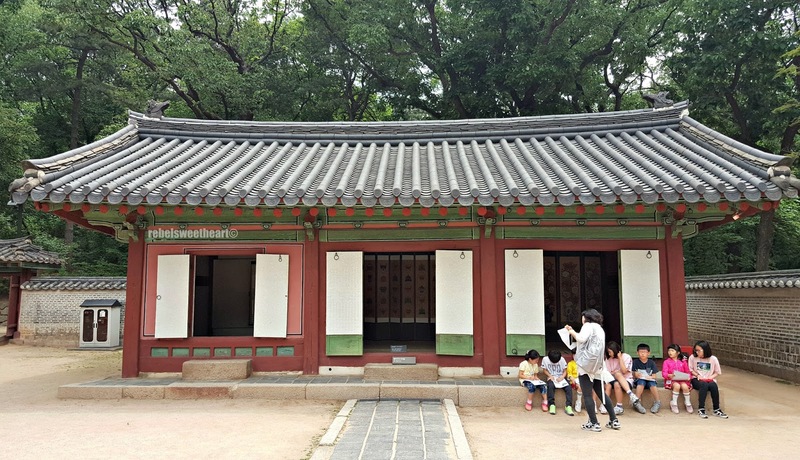 This 600-year old Confucian ritual still exists in the present day, held annually at Jongmyo Shrine during the first Sunday of May. 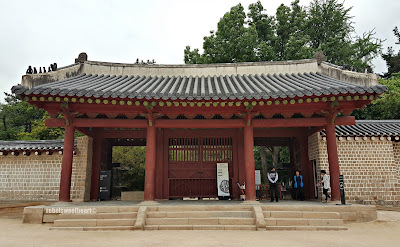 The gate of Jongmyo Shrine. 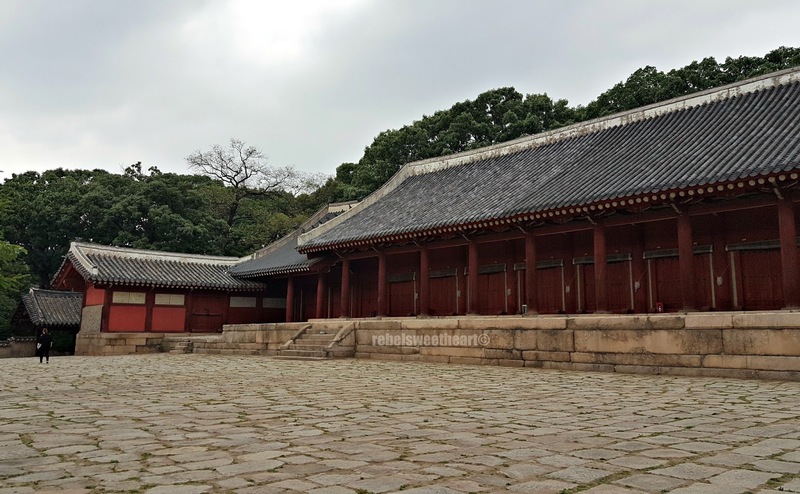 Unlike the four grand palaces where the influx of visitors day in and day out is an ordinary sight, Jongmyo Shrine does not have a very upbeat, touristy vibe. Surrounded by dense woodland, the shrine exudes serenity and solemnity and gives you that feeling of 'connected-ness' with nature. Stone walkway inside Jongmyo Shrine. They say the middle path is reserved for the spirits. Built under the order of King Taejo, the first king of Joseon, Jongmyo Shrine originally had only one shrine hall - Jeongjeon. Jeongjeon, the main hall of Jongymo Shrine. 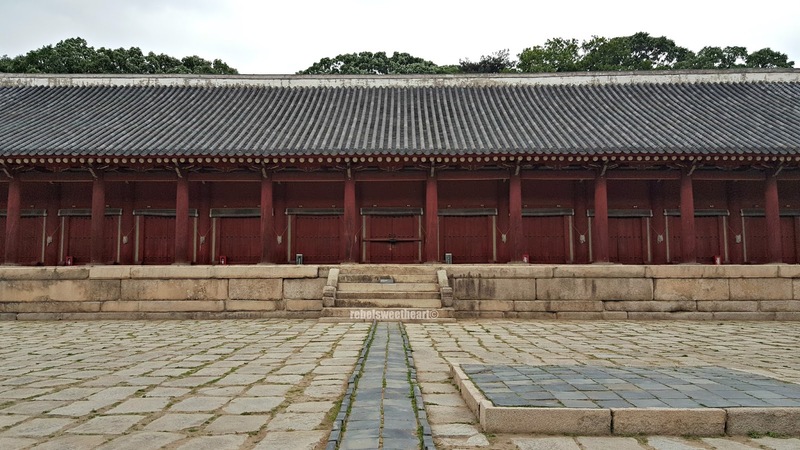 This hall houses 49 spiritual tablets of the deceased kings and queens of Joseon, kept within the 19 chambers of the building. Measuring 109 meters (357 feet) in length, the Jeongjeon Hall is said to be the longest single wooden structure in the world. The chambers, where the spiritual tablets are kept. Can you believe this structure is 600 years old? 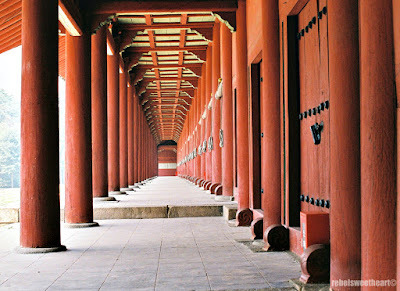 The picturesque columns of Jongmyo Shrine. One of my favorite photos of my son at Jongmyo Shrine, haha. Below the stone yard of the main hall are the Gongsindang (the Hall of Meritorious Officials) and the Chilsadang (the Hall of Seven Deities). 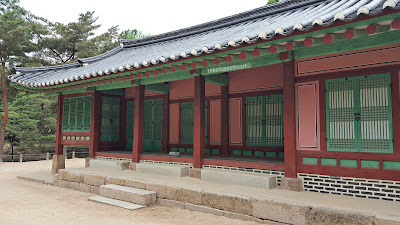 The Gongsindang houses the spiritual tablets of 83 meritorious officials who served the kings. Chilsadang, on the other hand, is a place of prayer and worship. This structure houses the spiritual tablets of the seven gods of heaven. 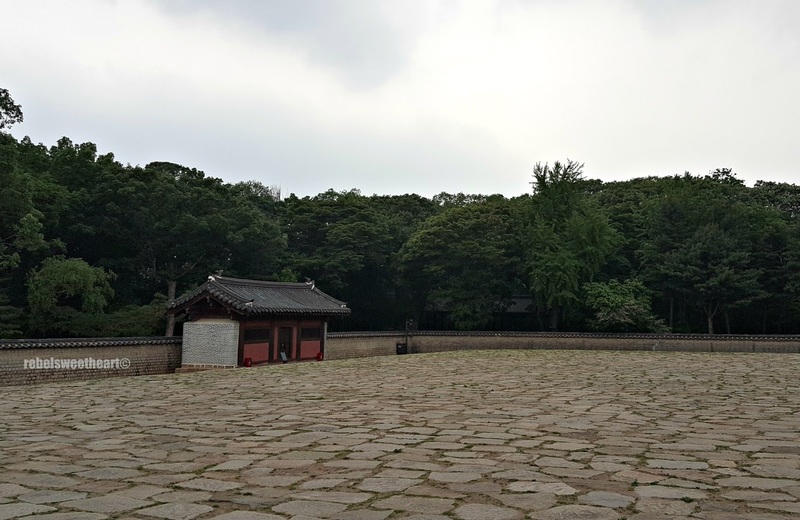 Right next to Jeongjeong Hall is the Jeonsacheong, an area specially designated for preparing food to be offered to the deceased souls in Jongmyo Shrine. 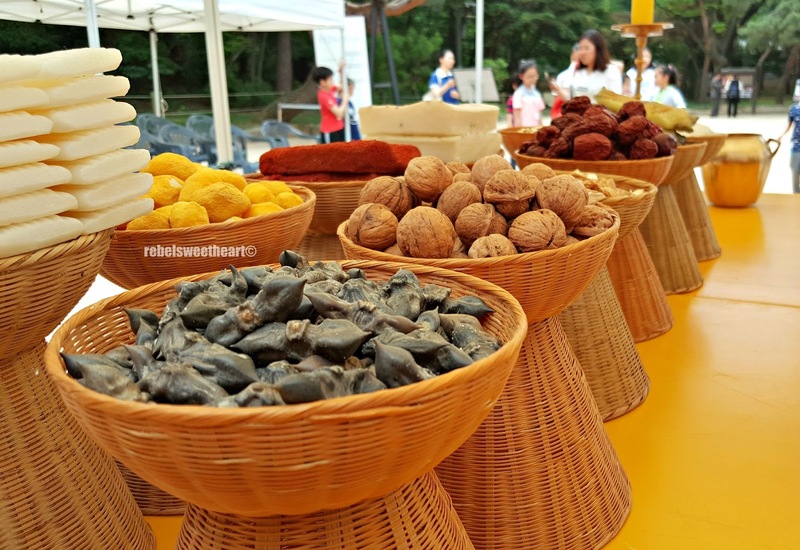 Here you will find the items used in ancestral rituals, and see how the food offerings are arranged on a table. Food offerings are arranged in a specific manner. 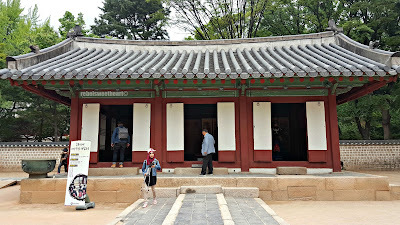 Located towards the left of Jeongjeong Hall is the Yeongnyeongjeon Hall. This structure was built in 1421 to enshrine four generations of King Taejo's ancestors. Also known as the 'Hall of Eternal Peace', Yeongnyeongjeon literally means 'long live both ancestors and descendants of the royal family in peace'. The stone ground and pathway. 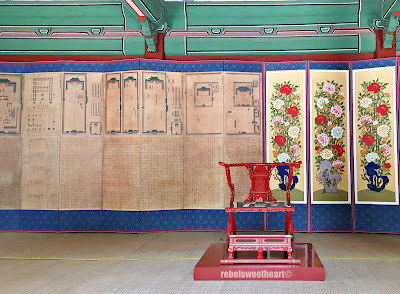 At present, this hall houses 16 kings and 18 queens, whose spiritual tablets are kept within the 16 chambers. 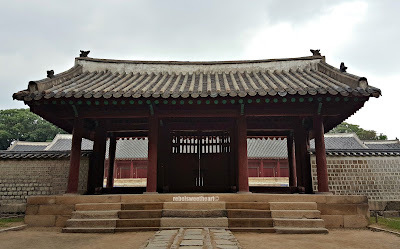 The main entrance to Yeongnyeongjeon Hall. 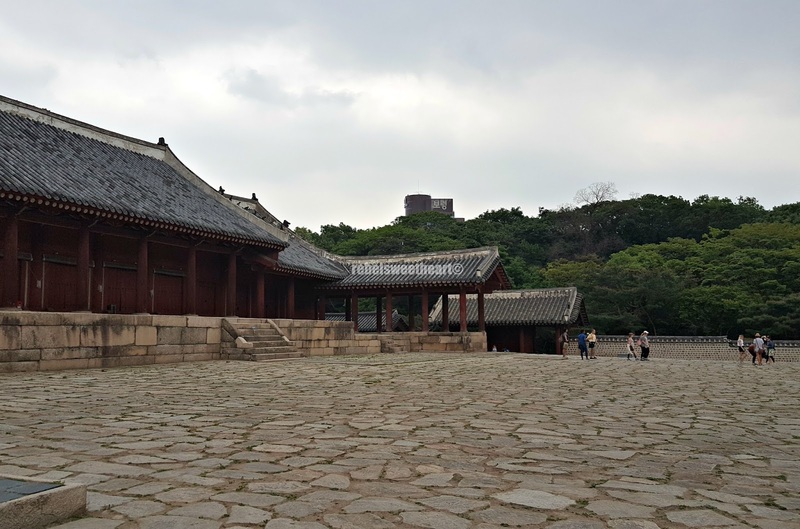 Also located within the shrine grounds is the Jaegung, an area composed of three buildings called Eojaesil, Saejajaesil, and Eomokyokcheong. This place was commonly used by the king and the crown prince for the ancestral rituals. 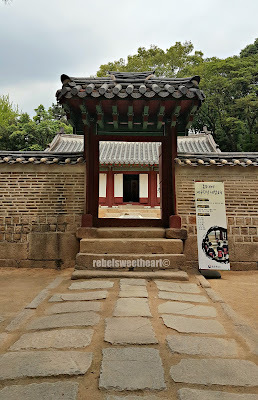 The entrance leading to the Jaegung area. 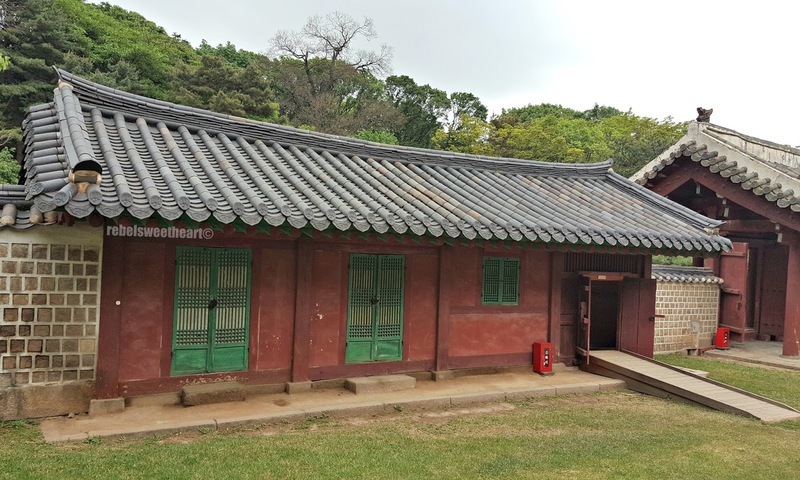 I reckon this is the building used by the king. How the king's ceremonial clothing looks like. 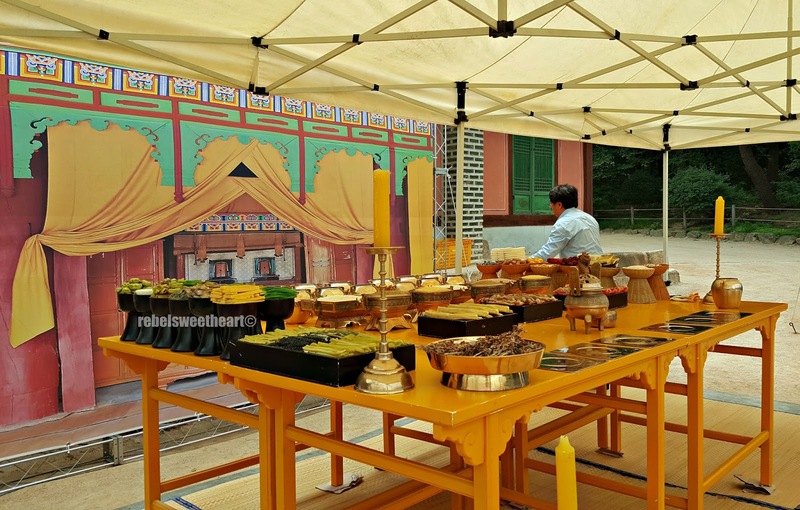 Preparation room for the king. 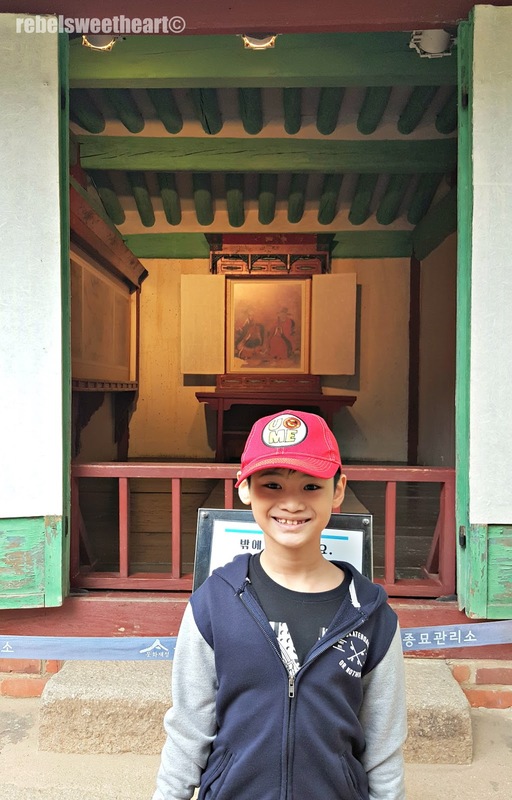 There were kids on a field trip that day. These kids were working on a school project. Near the entrance to the shrine is the Hangdaechong, an area where important supplies such as ritual paper, ceramics, and incense are stored. Within the area lies the Mangmyoru Pavilion, a resting spot for the king. After conducting the ancestral ritual, the king would stay here to rest. 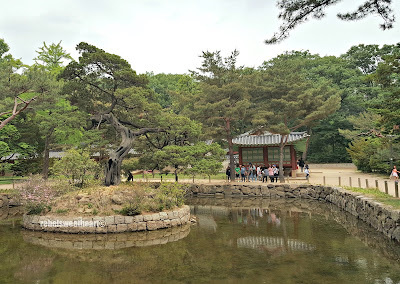 One of the two ponds inside the shrine grounds. As one of South Korea's most sacred landmarks, visitors may enter Jongmyo Shrine only in a guided tour group during specific times on weekdays (except Tuesdays when the shrine is closed) and Sundays. On Saturdays, visitors may enter at their leisure. 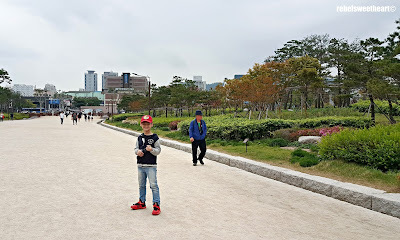 Yue and I visited the shrine on a Saturday so we were able to explore the area at our own pace. 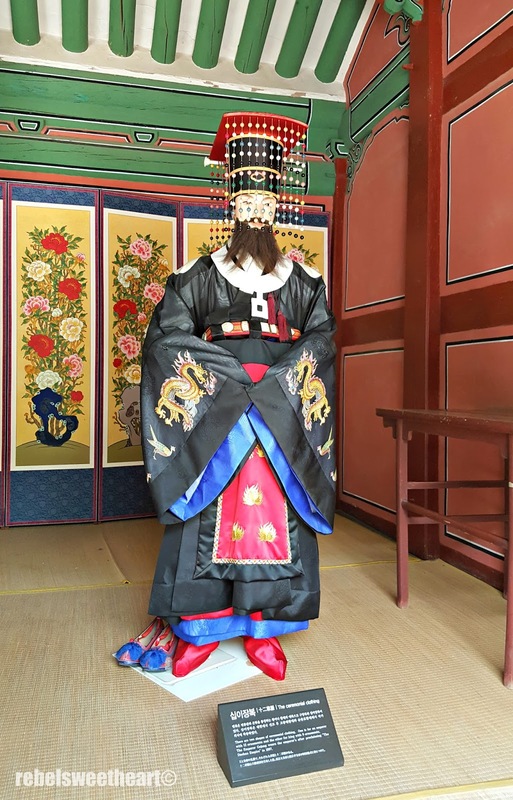 King Gongmin and his wife Nogukdaegang, a princess from Mongolia. 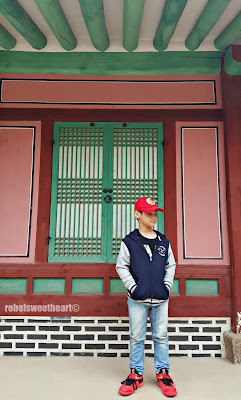 Meet your next fashion blogger, lol. 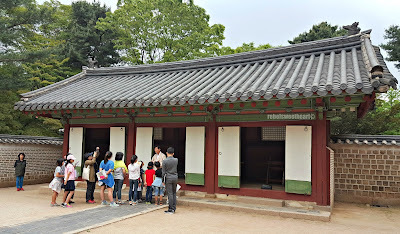 The guided tours are available in English, Japanese, and Chinese. 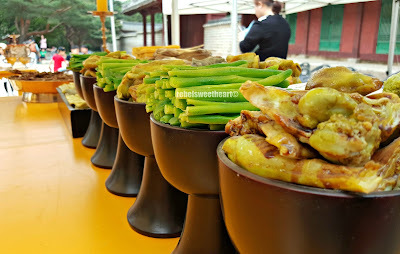 Admission fee is 1000 won for adults and 500 won for the youth aged 7 - 18. 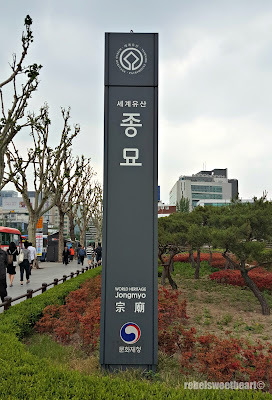 To get to Jongmyo Shrine, take the subway to Jongno 3(sam)-ga Station (Line 1, 3, and 5), exit 11. 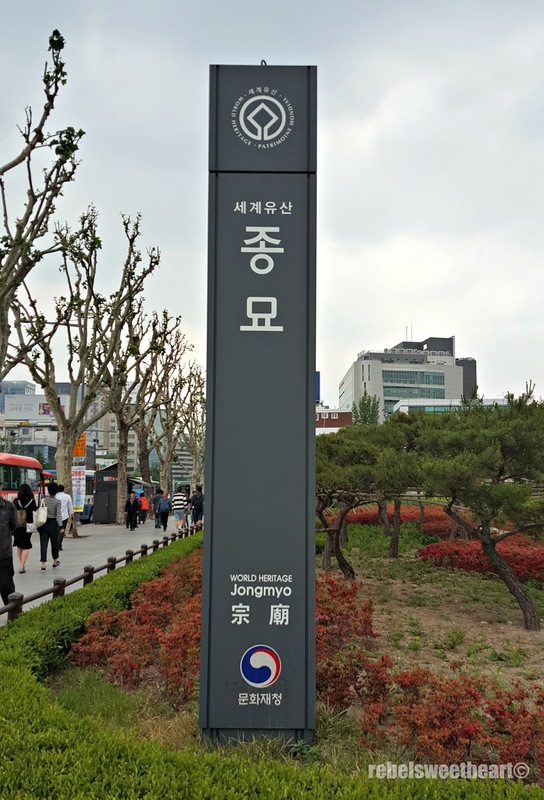 Alternatively, you may ride buses numbered 111, 201, 260, 270, 271, 721, N15, N62, or 9301 and get off at Jongno 4(sa)-ga Jongmyo Shrine Bus Stop. I would love to take my kids sometime. I think it's a great way to introduce some culture. 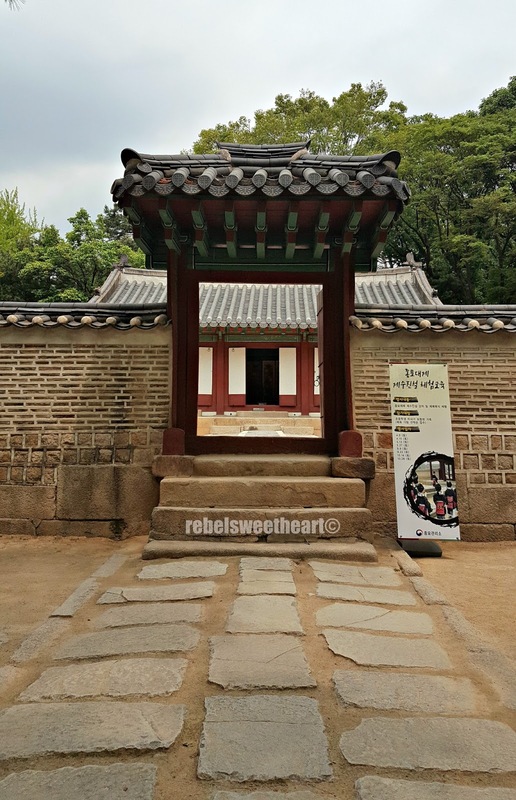 Great photos - I don't know much about Korea so it was great to read this and learn about your experiences. Incredible building structure! Sounds like a place with an amazing history! It must have been a powerful visit emotionally. 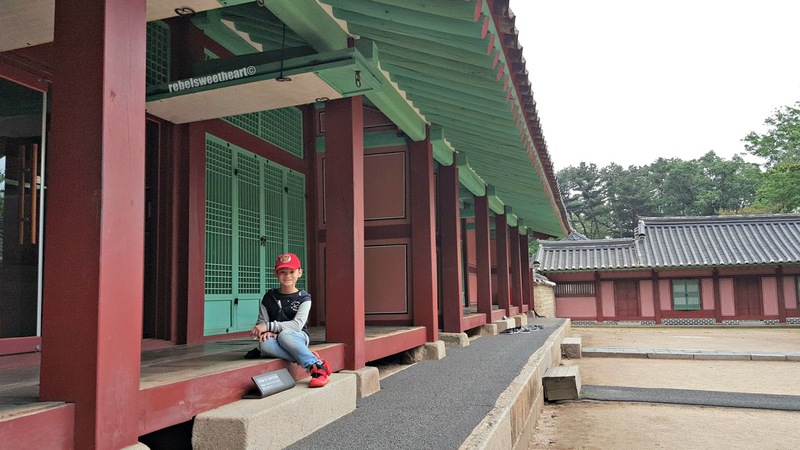 It sounds like you had an amazing time exploring the Jongmyo Shrine. It would indeed be a privilege to visit all these areas one day. We love all types of cultures and history in my family so this would really be amazing to see. Thanks for sharing the information. 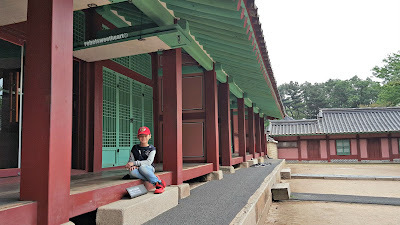 I do really love to visit Seoul Korea again. 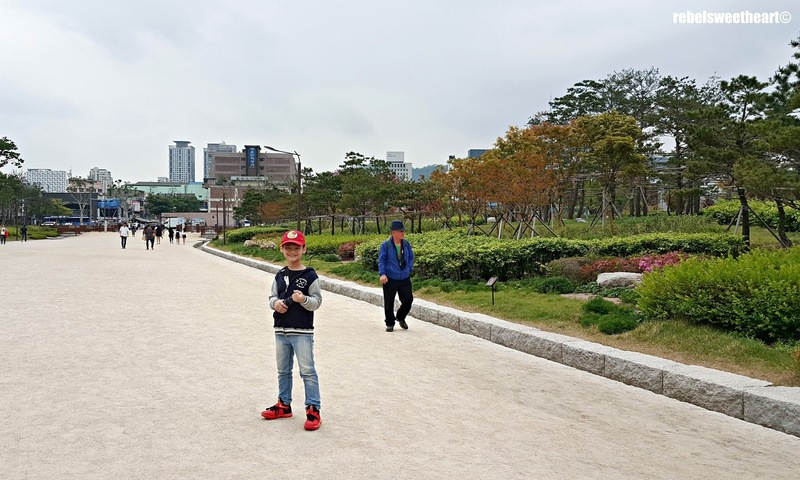 Seoul is such a beautiful and awesome place to visit. 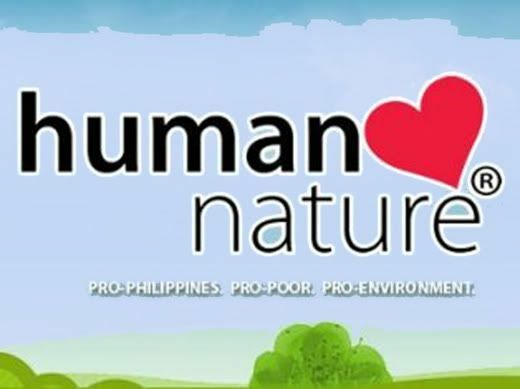 The peaceful and pleasant ambiance of the surroundings is so fulfilling. That's why many people love to travel visit this place. 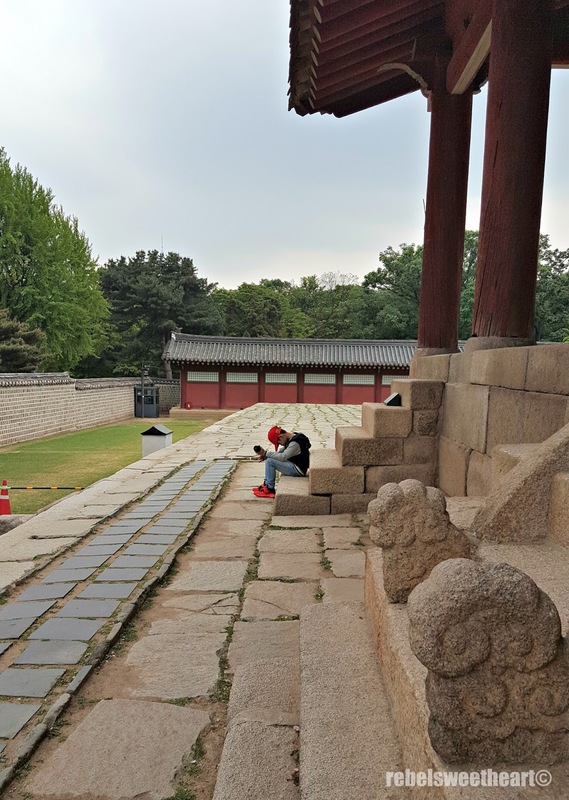 I have had an itch to get to Korea. I really have. There is just so much history there!